John Jeafferson was born in Suffolk in 1669, possibly at Ramsholt, son of Samuel and Mary Jeaffreson. 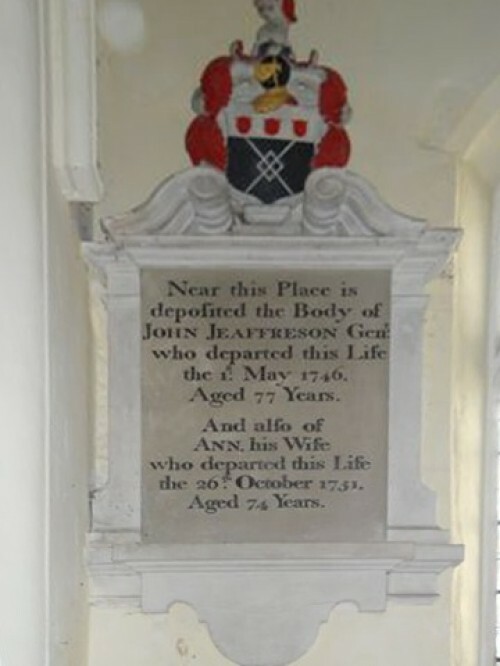 He died at Rouse Hall, Clopton, in 1747 aged 77. He was married to Ann who died in 1751. This was probably Ann Scott of Kettleburgh and they married on 2nd October 1698. Although their magnificent memorial adorns the Church relatively little is known about them. Some researchers indicate they had at least 8 children - Mary, Robert, Samuel, Christopher, Ann, John, Benjamin and Joseph, but this has not yet been verified. It is believed he was related to Col John Jeaffreson (possibly his grandfather), who was born in Petistree in 1590. John and his friend Thomas Warner set sail for the Carribean in 1620 and they discovered St Christopher Island - now know as St Kitts. John spent 20 years in the island before returning to England to marry Mary Parkins in 1656.